Oct 24, 2017 (LBO) – A research firm has found out that promises included in the 2017 budget shows poor action with over a half of key budget proposals remain weakest even in terms of information disclosure. 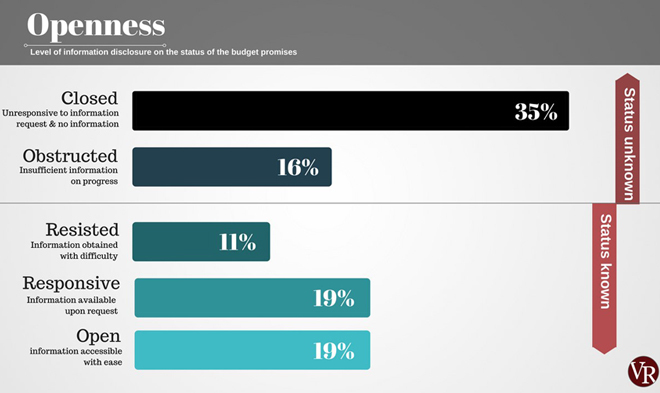 Launching an online platform for tracking budget promises, private think tank Verité Research said over 51 percent of the key budget promises lacks sufficient information to track their progress. The platform tracks the implementation of 37 budget promises (proposals with over Rs1bn) announced in the budget speech for which the government allocated 117 billion rupees in 2017. 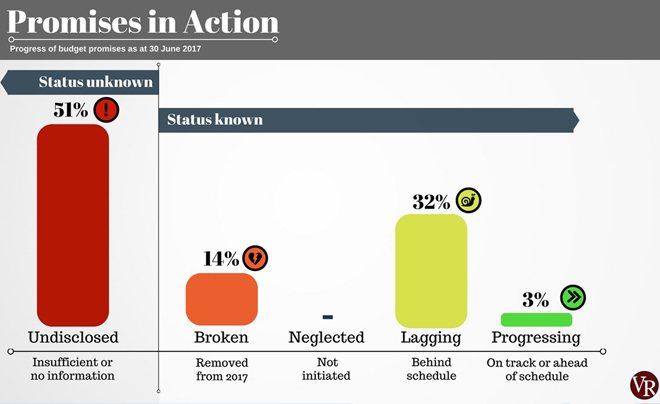 The research that tracked budget promises for the first half of this year, showed that around 14 percent of the promises are broken while 32 percent are behind the schedule and only 3 percent are showing progress. According to Verité, road improvement in rural areas carrying out by the Ministry of Local Government and Provincial Councils with 4,500 million rupees budgetary allocation is the only major budget proposal that is currently showing progress. Even though 2017 budget proposed to reveal contracts related to all capital projects on the websites of relevant ministries, Verité Research has found out the information provided on these websites to be minimal. “Contacting the relevant government agencies to get information proved to be difficult and we filed RTI applications to obtain information,” Assistant Analyst of Verité Research, Nilangika Fernando said. Fernando, however, commended the ICTA for proactively engaging with the research team to fulfill information requests relevant to their agency. She said 2017 budget has allocated around 15 billion rupees for the digitalization process of the economy. Fernando further commended the Fisheries Ministry for publishing their action plan and progress report on their website as a voluntary disclosure. According to Verité Research team, the Agriculture Ministry has not yet submitted any response even under the new RTI.